Diffusing essential oils is an easy yet extremely effective and safe way of realizing the benefits of essential oils. And because the oils are dispersed throughout the room, everyone in your home or office gets the benefits from them too. An additional benefit of essential oil diffusers is that they also make your room smell wonderful. But just what is a diffuser and how does one work? An aromatherapy diffuser is simply a device that allows you to diffuse (i.e. spread) essential oils in the air. Once the molecules of the oil are in the air, anyone in the room will inhale them and the oil’s properties will then get to work for them. How they disperse the oil molecules depends on the type of diffuser, so let’s take a quick look at the different types now and consider the pros and cons of each. Evaporative aromatherapy diffusers are the most basic type. A filter is soaked in your chosen essential oil and then a fan blows air through this filter causing the oil to be vaporized. Pros: Great for traveling or when in your car. Work well for lighter oils such as the citrus oils. Cons: Not as effective as the more hi-tech diffusers. Don’t work so well for the heavier oils. Heat diffusers work exactly as their name suggests. A heat source gently heats your essential oils. This heat source could be a simple candle or an electric filament. The heat allows the molecules of your oil to break free from their bonds and move freely around the room. Pros: Can work more quickly to diffuse the thicker oils such as Patchouli oil. Great if you just quickly want a nice aroma in your room. Cons: The heat can affect the integrity of your oils making them less effective. Nebulizer diffusers work by breaking down the oil into small droplets. They work in pretty much the same way as perfume atomizers do. The oil is pushed through a screen which causes it to be broken down into tiny particles. These particles are then sprayed into the air as a fine mist. Pros: No water or heat source is needed. They use cold air so the integrity of the oils isn’t affected. They make the essential oils more therapeutically effective as they break them down into small droplets which are more readily absorbed when you inhale them. Since they have no light source, you can use them during the night. Cons: They tend to use oils more quickly and they don’t work so well for the thicker essential oils. Can require more cleaning and maintenance. Can also be noisier. 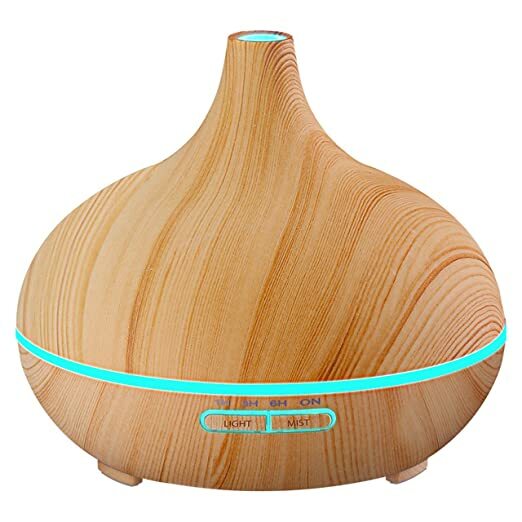 The most hi-tech of all the aromatherapy diffusers, ultrasonic diffusers work by using ultrasound to create waves in the water in them, and the essential oil that sits on top of the water. The result is that the oil is vaporized and dispersed into the air as tiny droplets. Pros: The fine essential oil mist they create works very effectively and maximizes the therapeutic benefits of the oil. They have the added benefit of also humidifying your home or office. They also tend to be relatively inexpensive. Cons: They seem to be more liable to break down or run into problems than other types of essential oil diffusers. Not recommended for citrus oils as these can cause erosion. What’s the best essential oil diffuser? So now we’ve taken a look at the various types of essential oil diffusers, which is the best? Well, that’s somewhat subjective and a matter of opinion, but to my mind the ultrasonic diffusers are the best because they really allow you to get the most benefit from your oils, while at the same time adding humidity to a dry room. And among the ultrasonic diffusers, my current favorite is the Vic Tsing Cool Mist Essential Oil Diffuser. I love this particular one because it’s quiet and reliable and it also has lots of different mood lights. You can also turn the light off for use during the night and even rotate through the different lights automatically, if the mood takes you. It also has a huge capacity which lets you run it for up to 10 hours, and includes a timer with 4 time settings.